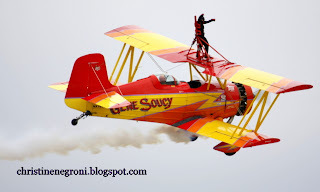 If you are operating under the impression that air show megastar Sean Tucker confines his fancy maneuvers to his airplane, I'm here to tell you, he does not. Yesterday at the NTSB hearing in Washington, I watched him dazzle a panel of hardened air safety investigators looking into ways to improve air show and air race safety. "It's not basket weaving 101", he said, all gosh, shucks and boyish charm and the five board members from Mark Rosekind on the left to Earl Weener on the right practically cooed. But Tucker has a point. In a demonstration of courage and cojones, he was one of only a few of the air show/air race luminaries who testified at the hearing willing to admit that all ain't right in the world of performance aviation. Well, as Chairman Deborah Hersman said early on, "Danger is part of the attraction." But when 11 people end up dead and dozens more are injured as happened on the final day of the Reno Air Races on September 16, 2011, the usual blandishment that "Safety is our number one priority" no longer seems sincere. Let's be honest, safety is not the number one priority or all those souped-up planes and hot-shot pilots would be safely on the ground. Thrill seeking is the number one priority for the performers and for the spectators. The question is; can safety be the co-priority in sport aviation? But the safety folks can't be carried aloft on the winds of good intentions. Real issues, as of yet unaddressed, have been brought to light by the Reno disaster. Jimmy Leeward, the pilot whose nosediving P-51 turned the box seats at Reno Stead Airport into a scene of carnage, was 74-years old. 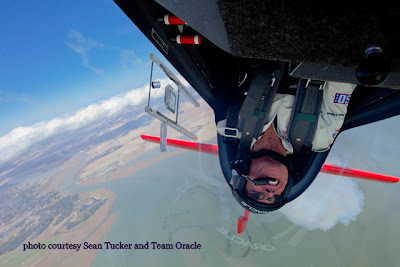 To fly competitively and undergo the extraordinary physical stresses of air racing, he was required to have just a 3rd class medical certificate, the same sign-off as your basic general aviation pilot. 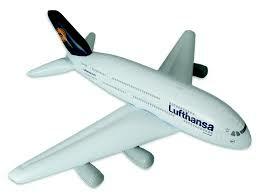 Then there is the airplane. Leeward's P-51 was as far removed from its original design as the family Ford is from a Formula One race car. And whether airworthiness has been compromised by all that performance-enhancing tinkering can be a difficult question for FAA inspectors to answer authoritatively. "They can check that things are tightened down and make sure things are properly greased but they can't say that the thing is going to hold together, they don't have the expertise," said Mike Danko, an aviation lawyer from San Mateo, California. Mike spoke with me yesterday while I was working on a story about the hearing for The New York Times. These omissions speak to the question of pilot hazards and one can argue that the men and women who fly in this environment know what they're getting into. 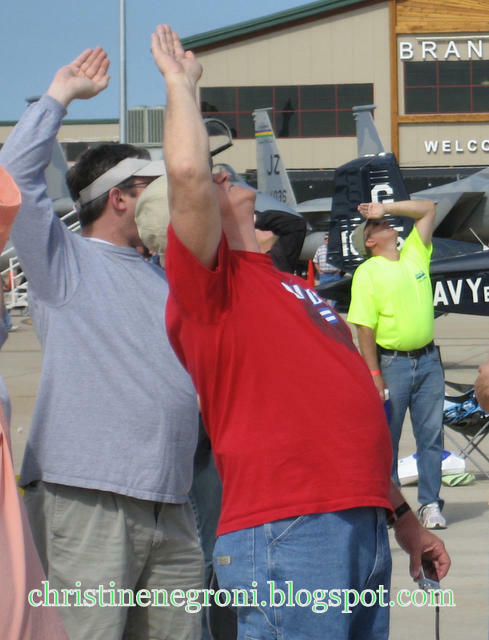 But it becomes a matter of public concern in the third area into which the NTSB board members tiptoed yesterday; are the setbacks for air show spectators appropriate? 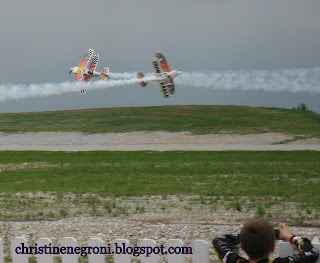 In his testimony, Mike Houghton, chief executive of the Reno Air Race Association was unequivocal, even after Hersman pressed the point, reminding Houghton of a crash on the track at the 2007 Reno air race. "We looked at debris disbursement and compared it with what had been established," Houghton said, of the set backs established years earlier and how they impacted the safety of race attendees in the 2007 accident. He continued, "and all the calculations were correct. We were 75 feet short of the spectator area. In spite of that we took steps to put Jersey barriers on the other side of the racecourse between taxi and runway to mitigate if something should ever happen again and if debris were to happen it would be stopped by the barriers." Hersman wasn't the only one raising the figurative eyebrow about the notion that the course of an out-of-control airplane can be predicted. Danko says the premise is fallacious. "They’ve used geometry and physics to say we’re going to design a course so the aircraft is never pointed at the crowd," he said. "But it's based on a false premise that if it fails in flight it will travel in a straight line. It may not travel in a straight line. It may go out of control. A control surface breaks off it may go in an unpredictable direction." Predictably, a control surface did appear to come off Leeward's plane which then landed nose down within striking distance of a crowd of spectators. Leeward, Tucker and all the other performance pilots are not alone. They share the risks with every thrill-seeker who buys a ticket to an air show. Any industry capable of pushing envelopes like this one does can surely balance mitigating the risks with maintaining the sport. But the first task on the check list is acknowledging the real priorities. The FAA isn't doing its job. They rubber stamp modifications without fully testing the aircraft under the conditions they'll encounter in racing situations. Likewise, pilots must demonstrate that they are physically capable of coping with the rigors of competitive flight in high stress competition. 1st-class physicals are the least that should be required. IMO a race amongst equally configured aircraft is much more interesting, as the outcomes depend on pilot skill rather than the extremes to which the planes can be modified. When airplanes begin coming apart in the air, the modifiers have gone too far, and should be held accountable for the outcomes. Good to see that finally someone is acknowledging that safety ISN'T the #1 priority, but that it has to be a balanced approach. But, I still haven't seen anywhere where people are talking about how much risk is acceptable. How much risk are people willing to take? Injuries in the crowd? no injuries to anyone, pilots or spectators?Without knowing what your end goal is, it is more difficult to set priorities, and end up destroying the objective because of all the 'safety' rules - just look at how OH&S has gotten out of control. 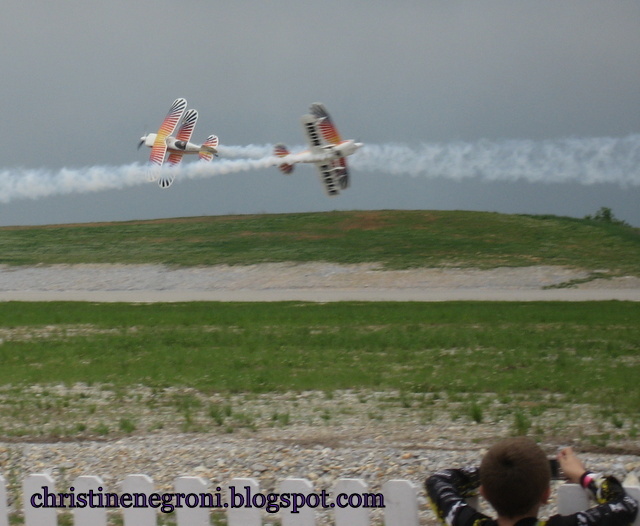 Minimizing the risk to air race (air show) spectators is an admirable, but elusive goal. Air race safety is almost an oxymoron. Speed, performance, maneuverability and control are at odds when racing any kind of vehicle. Whether it is a highly modified P-51 or a standard B-747, the safest place for any airplane is always on the ground. I remember very well the tragic Indy 500 accident in May 1964 that took the lives of Eddie Sachs and Dave MacDonald. That crash prompted a number of modifications to the race. Spectators at the track in Indianapolis have been seated behind heavy structures for many years. I will admit, the steel and cables do not improve the view, but they do afford spectators a level of protection. When looking at airplane racing, one has to acknowledge its 3 distinct characteristics that make safety for the spectators particularly difficult. First and most important, the race is conducted in a 3 axis environment. This leads to the second unique characteristic, the size of the race course. Finally the high speed of the vehicles increases exponentially the energy of any jettisoned pieces that the spectators might be exposed to. Assuming the airplanes have been inspected and deemed airworthy and the pilots are properly certified, I believe spectators should be allowed to make an informed decision on their viewing location.